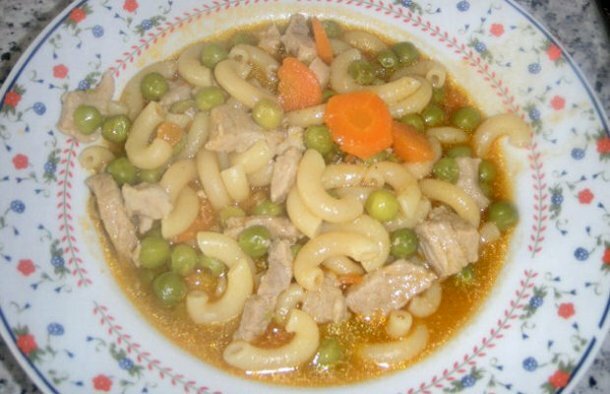 This healthy and delicious Portuguese meat, pasta and peas soup recipe (receita de sopa de massa de carne com ervilhas) is very easy to make. On a pan, cook the onion, garlic and bay leaf on some olive oil (to taste). 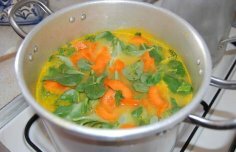 When the onion is golden brown, add the meat, the carrot, the chicken broth cube and some water (to taste). 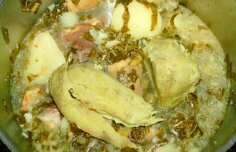 Let it cook for about 15 minutes. Now add enough water to cook the pasta and season it with salt and pepper. When it begins to boil, add the pasta and the peas (add a little more water if needed). Check the seasoning and let it cook for about 10 to 15 minutes or until the pasta is cooked to your liking, enjoy. 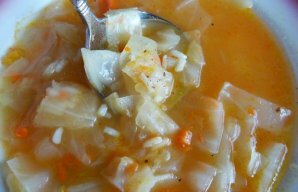 How to make Portuguese vegetable soup.